Maintenance of the home geothermal ground heat pump system is very important in order to achieve maximum efficiency and fully benefit from this renewable energy source, saving the homeowner up to 15% in energy running costs. 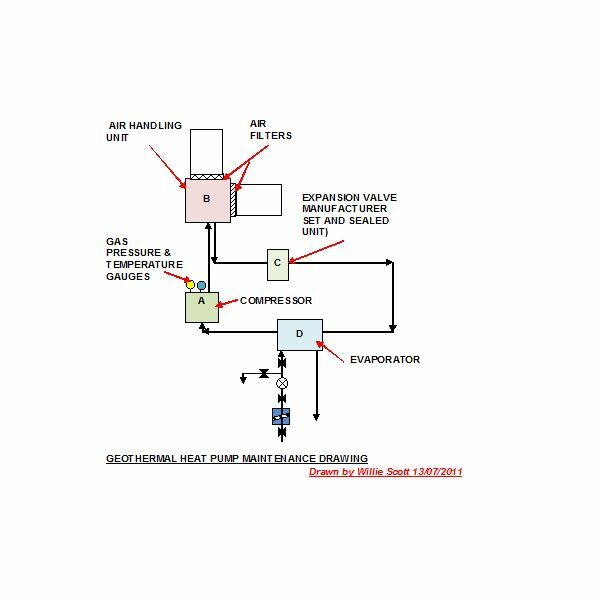 It is imperative that the manufacturer's operation and maintenance instructions (O & M) are followed including an annual service by a registered, qualified geothermal energy engineer. This will ensure that the rotating components such as compressors and circulation pumps will last the estimated life of the geothermal system of 35-50 years. The following sections provide step by step instructions accompanied with simple diagrams that can be printed off and kept along with the operation and maintenance manual for the system. 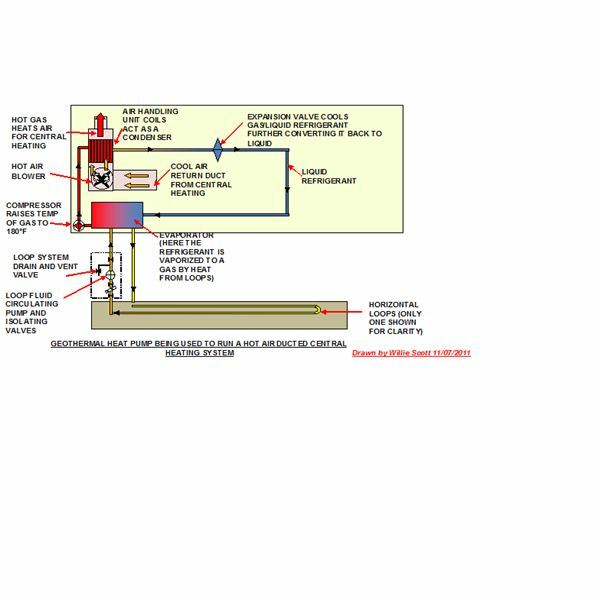 The first section gives an overview of how a geothermal ground pump operates when supplying heat to a hot air central heating system. The refrigerant is the heart of the heat pump operation. It has a very low boiling point so requires low temperatures to vaporize it and this heat can then be transferred to a home heating system. Many years ago when the author was a ships engineer at sea, CO2 was used as a refrigerant in the ships' refrigeration plant. The refrigeration plant was required when carrying frozen cargo such as lamb and dairy products to Britain from Australia and New Zealand. Before leaving the navy, the CO2 was replaced by Freon R12 refrigerant; a much more efficient gas that resulted in smaller components, higher efficiency and, allowed more space in the plant room for maintenance by the ship's engineers. The Freon was used until the ozone hole was discovered. Freon R12 was banned in 1987 (through the Montreal Protocol) as it contained ozone-depleting chlorofluorocarbons (CFC’s). Its successor, Freon R22, although containing less CFC’s, is now also banned and is subsequently being phased out. Nowadays, an environmentally-friendlier refrigerant known as R 410-A, is used and although it adds to global warming if it escapes from the system, it does not deplete the ozone layer. Liquid is pumped through the geothermal loops and a filter using a circulating pump. The liquid is a mixture of water, non-toxic antifreeze containing enhanced heat conductive properties usually manufactured from vegetable oils. The mix protects this part of the coils from freezing and the pump and filter from internal corrosion. The liquid heats up due to the geothermal energy in the soil and this is transferred to the refrigerant via an evaporator. An evaporator is just a heat exchanger where the liquid from the coils is pumped around small pipes that contain the refrigerant. The refrigerant has a low temperature boiling point, so it flashes off to vapor, being further heated and compressed by the compressor to around 180°F. In a hot air heating system, this hot gas is passed through coils of copper pipe in a condenser (another heat exchanger) in the air handling system. A circulating fan blows air across the pipes heating it up before circulating it through the rooms in the house. Because of the fan blowing cold air across the condenser, the gas inside the coils turns to part liquid before passing onto an expansion valve that both cools the liquid and condenses any remaining gas. This liquid refrigerant is passed back through the evaporator again, being heated once more by the liquid circulating through the underground coils. This heat converts it once again to a vapor, completing the heat pump cycle. 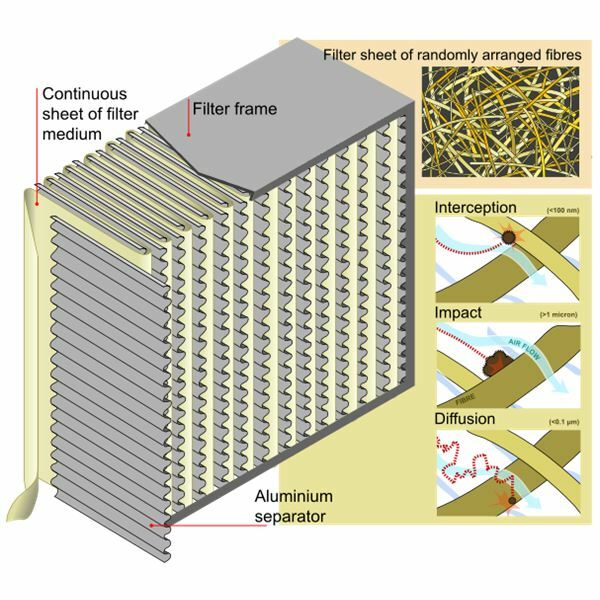 These filters form part of the hot air central heating system, but are included as they play a part in the heat pump system's efficiency. (a) Before replacing or cleaning the air filters, the power to the hot air heating system and the heat pump system should be isolated. (b) A disposable face mask should be worn over mouth and nose. 1. The filter is accessible by removing the housing lid usually held in place by two spring clips or screws that can be loosened and released using a screwdriver. 2. The filter can now be removed and bagged tightly for disposal. 3. The new filter is now fitted and the covers clipped tightly into place. 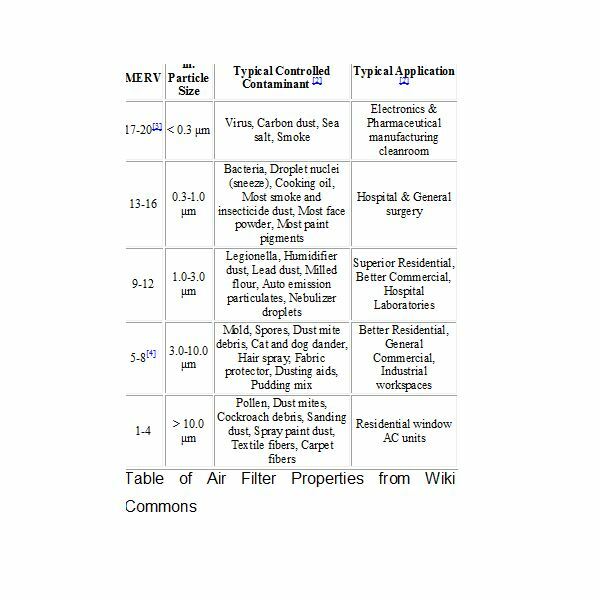 The majority of air filters are disposable and should be changed at least every three months. Permanent, cleanable filters should be cleaned every one to three months after being removed as per the disposable type. They are usually made from fabric and can be cleaned using a vacuum cleaner hose. The vacuum cleaner bag should then be discarded and a new bag fitted. (a) Before changing the filter, the power to the system, including the circulating pump should be isolated. (b) Rubber gloves and eye protection should be worn when handling the filter. 1. 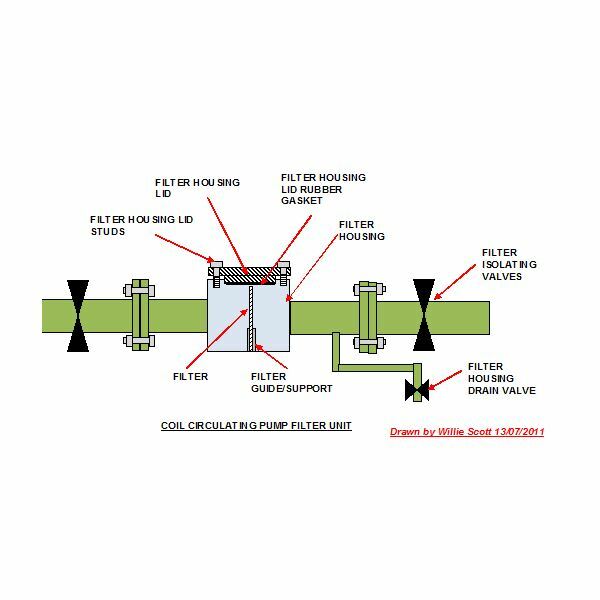 The filter is isolated by closing the valves V2 and V4 and opening the drain valve V3 letting the pressure of the system. 2. The filter housing lid is usually fitted using stud bolts, and these are removed slowly in case any pressure remains in the system, allowing the lid to be lifted clear. 3. The lid mating face with the housing has a rubber gasket or ring fitted and this should be renewed. The manufacturer will be able to supply a new gasket/ring to fit on reassembly of the filter housing. 4. The filter is now accessible and can be lifted clear of the housing. Remember to wear disposable gloves when handling the filter as the circulating fluid contains antifreeze and anticorrosive inhibitors. 5. Immerse the filter in a bucket of warm water and use a wire brush to clean any debris/algae collected in the mesh. 6. Dry the filter and ensure it is clean before refitting into the housing. 7. Replace the rubber ring and stud bolts, ensuring they are tight. 8. Shut the drain valve V3, then open just a fraction before opening the valves V2 and V4. This will fill the filter housing with the operating fluid, any air being expelled through the valve V3, then shut V3 after a few minutes. 9. Inspect the filter housing for leaks and if none evident, start the circulating pump; then inspect the housing again for leaks. The circulating pump filter should be cleaned every three to six months, a new rubber gasket being fitted each time. This completes the DIY residential geothermal maintenance for the homeowner; but remember to check the levels of refrigerant (this is usually evident from a small sight glass or glass window on the compressor). Also check the temperatures and pressures as noted in the O & M Manual. It is imperative to have the whole system checked and serviced once a year, by an experienced engineer. 2. Geothermal Loops Water Additives: https://www.cool-flow.co.uk/sureflow.html.